Main Street Lake Cruises is one of the premiere attractions in Branson that offer a variety of lake cruises for groups or individuals, from Fireworks Cruises to historic Sightseeing Tours. Main Street Lake Cruises not only offer scenic tours on the lake to private individuals and groups they also offer customized events for any occasion. Whether you’re planning a family reunion, a private party, wedding or looking for a unique option for your next corporate event, Main Street Lake Cruises has a wide range of customizable options to meet your needs. When you take a wonderful cruise on the lake, you can either choose the Lake Queen, a modern day riverboat replica, or the Landing Princess, a 100’ luxury yacht. Both the Landing Princess and the Lake Queen are climate controlled and each features cash bars and full-size restrooms. 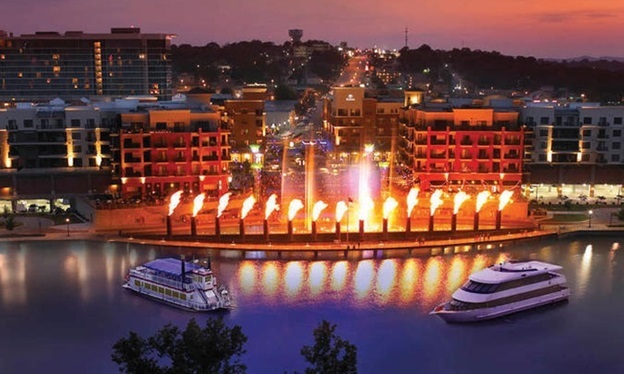 Before you enjoy a fascinating cruise experience with the Main Street Lake Cruises, you’ll get the chance to see spectacular Branson Landing Fountains, a $7.5 million attraction in Branson that synchronizes water, light, sound and fire. As you take sightseeing cruises or scenic tours along Lake Taneycomo, you’ll enjoy breathtaking panoramic views of the majestic Ozark Mountains and diverse Branson’s picturesque landscapes and beautiful wildlife. Whether you want to enjoy the fun with the whole family or a romantic escapade for two, Main Street Lake Cruises has a river tour that’s perfect for any occasion. Your tour guide will give you information on historical facts about the area and point out sights like the Historic Lake Taneycomo, Baldknobber’s-Branson’s first roller-skating rink, and the Hillbilly Jamboree, Branson’s first music show. The Lake Queen offers passengers a unique way to enjoy the natural beauty and charm of Branson. As you cruise along Lake Taneycomo, you will experience wildlife sightings that often range from Night Heron, American Bald Eagle, and Brown Thrasher, to foxes, coyote, and mink. The 100’ luxury yacht Landing Princess features two climate controlled entertainment decks that offer superb views from any deck. This yacht is the perfect choice for an elegant and relaxing river cruise as it provides ultimate passenger comfort. There are four daily sightseeing and dinner cruises offered by Main Street Lake Cruises. Each cruise takes from 1 ½ hours to two hours, and features different sights along the cruise route. The “Beach and Back Sightseeing Cruise” takes two hours to complete and gives passengers great views of the beautiful Ozark scenery and wildlife. You will pass by an antebellum style mansion, the campus of Kanakuk Kamps, the Boston Gold Mine site, Rockaway Beach, and what legend has to be Al Capone’s summer home on the 100’ Lake Queen paddleboat. Another option is the Morning Sightseeing Cruise which is 30 minutes shorter than the Beach and Back cruise. When you take a river cruise with either the Lake Queen river boat or the luxury yacht Landing Princess on Lake Taneycomo, you will know many exciting facts about Main Street Lake Cruises.